The 41330A Stereo Headphones are created to give you quality and comfort combined with a top-notch audio experience of clean highs to full-bodied lows for an incredible value. Please enquire for a class pack and quantity prices, either email sales@coomber.co.uk or call 01905 342070. Accurate audio reproduction: Powerful but perfect crystal clear sound, the 41330A headphones' acoustic tuning allows you to truly experience full frequency of sound with ample loudness without distortion but with a satisfying Bass. 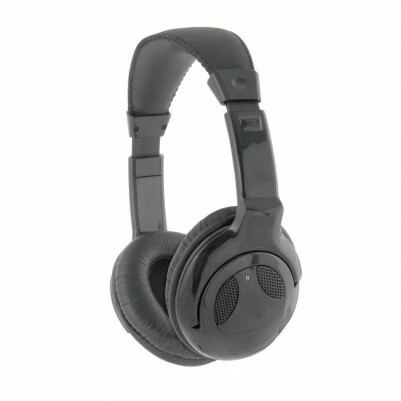 They provide very accurate audio reproduction for a rich, clear and dynamic sound. Robustly designed but comfortable: The 41330A stereo headphones have a lightweight comfortable sturdy over-ear headphone design. The soft cushioned ear pads are angled to gently follow the contour of your ears so that they don't 'bleed' sound to distract adjacent people and minimise background distractions. An adjustable, cushioned headband distributes weight evenly across the top of your head. Together with the ear pads, they help provide hours of continuous and comfortable listening. Versatility: These headphones suit modern audio products such as media players but also computers, laptops, etc. The gold-plated 3.5mm stereo plug fits the vast majority of audio devices with a headphone socket, iPods, iPads, MP3 players, etc. The headphones are fitted with a straight cord with single side entry. If you would like a Stereo Audio Adaptor to convert the 3.5mm to a 6.3 to use with your audio equipment please add a note with the order. USB Headsets and boom mic variants are available.